If you've managed to succeed in tutorials one and two, then this will be super easy for you. 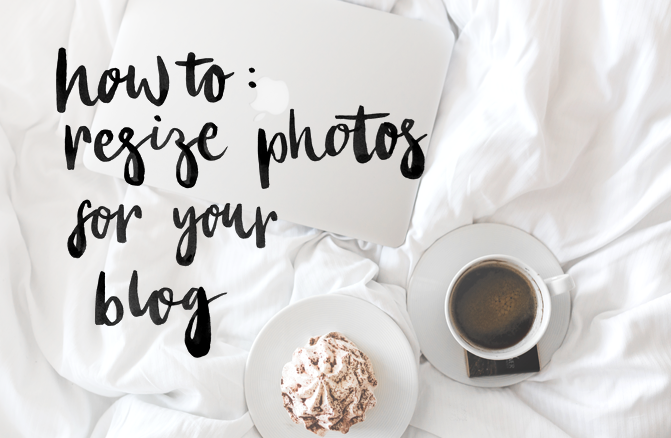 Hopefully ya know being a fab blogger and everything, your photos are perfect already but just in case here's how to make them fit perfectly inline with your blog. This is also the same way you can create sidebar graphics for your blog as well! 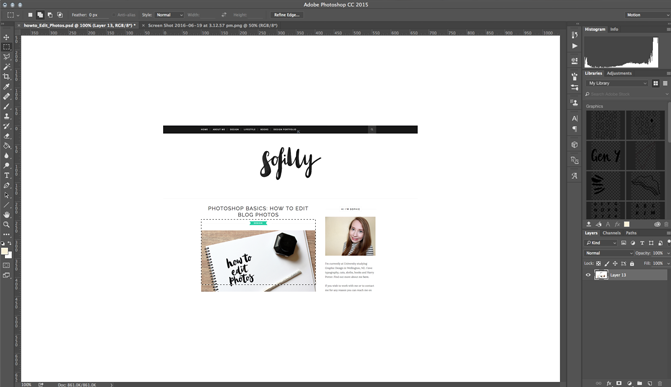 We're going to make a default post photoshop file, which you can then import any photo and make it the same size as all the other images on your blog. There are three ways to do this, two include knowing exactly how big you want your image (knowing your column width of your blog should give you the answer to this). 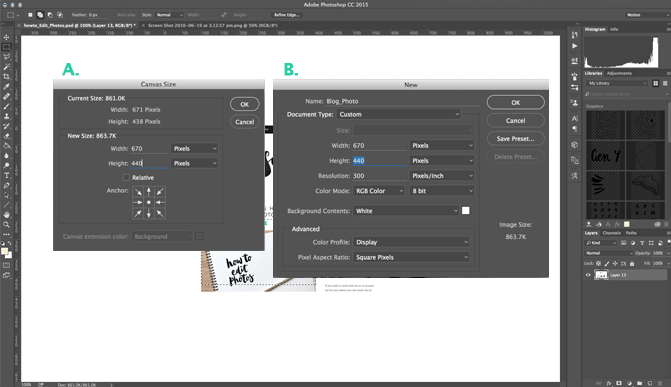 Which you can do either by A. opening an image and resizing it in the canvas size (Image > Canvas Size) or B. making a new document to that size and importing your image. However if you're unsure how large your column width is then continue to the third way (and my personal preference as it's simple). 1. The first thing to do is figure out the size you want your images. To do this simply take a screenshot of your blog. 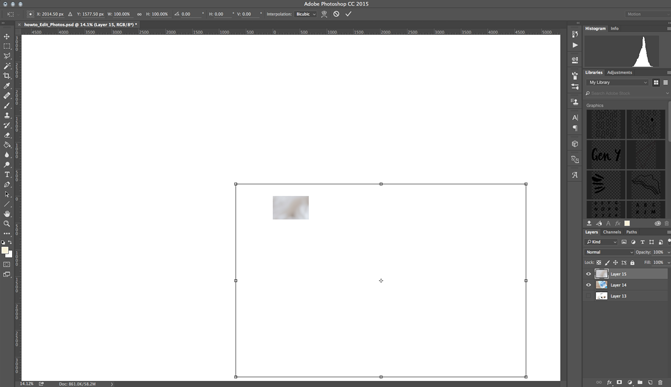 Then in Photoshop, using the Marquee tool (M on your keyboard) you can select the perfect box for your images. The width is the most important thing here, height can be changed for each individual image but the width will stay the same. 2. From here you can crop using the crop tool (C) which will automatically crop to your selection. This is now your default file which you can save as a PSD file and open for each and every blog post and insert your images. 3. Simply open your image and drag it into the default file, or copy and paste it if you prefer. Then using the Transform tool (command+T) and zooming all the way out (command+0) you can then resize your image into your preset sized box. Remember to hold shift to resize without distortion. 4. Then you can edit, add text, and save your image perfectly sized for uploading to your blog. Make sure when uploading to choose original size (Apologies I'm not 100% if this is similar on Wordpress etc but for Blogger this is correct.). How are you going, are you keeping up? Again let me know if anything is unclear, if you're struggling then probably others are too! This is the exact same method for sidebar images, just instead of selecting the rectangle of your posts, select a rectangle in your sidebar. If there's anything else you'd love to know let me know.